About 2,100 National Guard troops are already fanned out across the border under an order from President Donald Trump earlier this year. The Pentagon will deploy up 5,000 active-duty troops to the U.S.-Mexico border in an effort to prevent members of a migrant caravan from illegally entering the country, a U.S. official said Monday. The troops are not expected to conduct law enforcement activities, but instead provide backup support to Border Patrol agents manning the border and be prepared to react if groups of migrants try to storm the border. 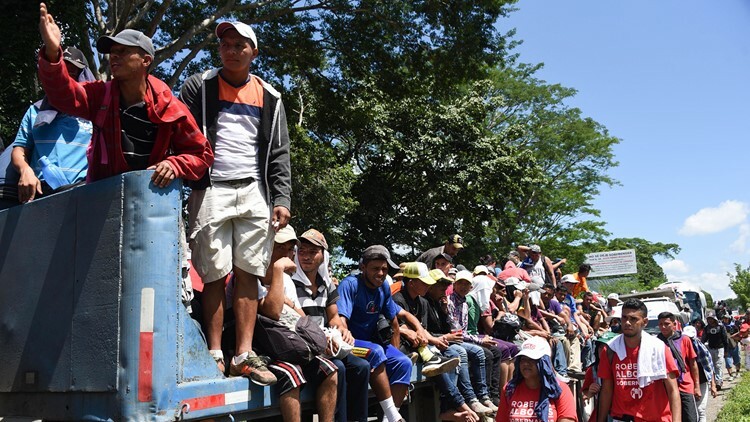 Those moves represent the latest in a series of efforts carried out by the administration attempting to show a robust response to the migrant caravan as the midterm elections draw closer. Department of Homeland Security Secretary Kirstjen Nielsen on Friday showed off a recently-completed section of border fence in Calexico, Calif., that including a plaque proclaiming the "completion of the first section of President Trump’s border wall." That section had been deemed a priority and funded during the Obama administration. That's what a majority of people did when the last migrant caravan reached the U.S. border in April — 122 were caught trying to enter the country illegally, but 401 presented themselves at ports of entry to request asylum, according to data from U.S. Citizenship and Immigration Services.